Our hands-on reviews considered over a dozen double strollers, testing them out for flexible infant and toddler configurations, comfort for parent and child, size and weight, folding capabilities, and compatibility with popular infant car seats. If you want to read more details about how we considered each of these factors, scroll down to the bottom of this article or check out our comprehensive stroller buying guide. Otherwise, here are our reviews of the Top 8 Best Double and Tandem Strollers of 2019! There are a lot of important things to consider when you pick a double stroller. Will it be a side-by-side, tandem or inline stroller? Will it be a pain to fold up? How heavy will it be? Will it fit through doorways or in the trunk of your car? Will it fit two kids of different ages and sizes, or only twins? Buying a double stroller can be daunting, so before you drop $300-750 on a stroller, read through this article to get some helpful buying tips! Here are the Best Double Strollers of 2019! 1. BOB Revolution Flex Duallie Stroller. This is a side-by-side or "duallie" double stroller with some great flexibility, smooth ride, great features, and good size and weight. This top pick is the smoothest riding double stroller we tested, it really glides like a dream and it's not just for jogging. Unlock the swivel front wheel and it makes an awesome around-town stroller. 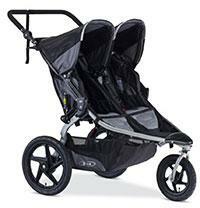 And BOB makes some of the best quality strollers out there (it's also at the top of our best jogging strollers list). We broke out the measuring tape and at its widest point this stroller is just under 31" wide. The standard exterior door opening is 35" wide, with interior doors being about 29" wide. So while you won't be able to get it through the door to your bedroom, you'll definitely fit it into the door of your house or the local coffee shop. If it doesn't fit, they are violating fire code! Folded up, the BOB Revolution is still quite large: we measured about 39" long and 16" high. The width is the same at just under 31". The size (and weight at 34 pounds) scared us, but in our testing we were able to easily fit it in the trunk of a Toyota Corolla and Honda Accord, so that made us more comfortable. We didn't even have to remove the wheels. If you pop the wheels off, you can fit a lot more in the trunk as well, like some groceries or beach gear. Some features we loved: adjustable handlebar height to accommodate mom and dad, relatively easy two-step folding, suspension keeps bump smooth, comfortable seats, large diameter wheels for jogging, and it felt stable and well made. We also loved how far out the two independent canopies came on their second extended setting, blocking not just sun but also doing a pretty good job blocking rain. The cons? Well, it is an expensive stroller and the add-on features can rack up some considerable cost. For instance, if you want to add the BOB infant car seat adapter or snack trays, that will be an extra $99, and if you want the BOB cup holder that will be an extra $25. Also, instead of swapping a toddler seat for an infant car seat, the infant seat sticks up sort of awkwardly from the stroller when using the attachment. So if you have the cash and want an excellent double stroller, this is the one for you. Interested? You can check out this BOB Double Stroller here. 2. Joovy Scooter X2 Double Stroller. Another excellent side-by-side double stroller option, by the same company that makes several other top-rated strollers appearing on our other lists. Joovy is well known for mixing great styling with functionality, for a reasonable price. This double stroller is no exception. This 30" wide stroller can fit through most standard doorways, while still supporting up to 45 pounds per child (90 pounds total). We liked that each seat could recline independently, and footrests could also adjust independently. The independent recline is not unique on this list, but the footrest aspect is. Some good features include: two cupholders for parents, two good-sized zippered pouches for parents (great for phones and keys), a really large storage basket underneath, good sized wheels (7" front, 9" back) to help over the bumps, and a truly huge canopy. Folded down, we measured it at 30" x 36" x 14" thick, which is smaller than the BOB Revolution, but larger than the Baby Jogger. Weighs just over 30 pounds, which is heavy, but there's a lot of stroller here. Couple of small downfalls relative to other options. First, the canopy covers both children, so you cannot have one down and the other up like you can with the BOB Revolution or the Baby Jogger. Second, it doesn't stand on its own while folded, which is an issue for most of the strollers on this list. Overall, this is an excellent stroller with only some very minor drawbacks. All the most important features are there and in abundance, very impressive at this price point! Interested? 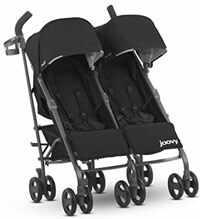 You can check out this Joovy Scooter X2 double stroller here. 3. Baby Jogger City Mini GT Double Stroller. At a similar price point to the BOB Revolution Flex, this side-by-side double stroller is a close second place. There are several available right now: remaining stock of the old version and the newest model. This stroller has very similar features to the BOB, but with some important distinctions. First, both have adjustable handlebar height, an easy folding sequence, suspension to keep things smooth over the bumps, far-reaching canopies (the BOB wins here by a small margin), comfy seats, and high build quality and stability. In terms of size, the Baby Jogger folds to a considerably smaller size than the BOB, into a 30" by 31" rectangle only about 13" thick. Recall that the BOB had a dimension nearly 40" long when folded. So this fits more easily into smaller trunks: we got it easily into the Accord and Corolla, but also easily into the Civic trunk as well. This is partially because the wheels are much smaller than the BOB. Where that saves in size, it hurts in the smoothness of the ride. While the BOB is a dream glider, this is a bit more finicky and not as smooth. Opened up, this is 30" wide, about the same as the Joovy but a bit slimmer than the BOB. So overall this stroller is a reasonably compact package, but the trade-off is not having as smooth of a ride, particularly for jogging when you want those large diameter wheels. On our scale it was 33 pounds, coming in just under the BOB by 1 pound, and over the Joovy by 1 pound. If you're looking for something a bit smaller and lighter, this is the stroller for you. It's very expensive, however, putting the Joovy out in front by a bit of a margin. If you have a bigger budget and are actually interested in jogging (this one says "not intended for jogging" despite the name), the Baby Jogger Summit X3 Double Stroller is a better option, but it will cost you. Interested? You can check out this Baby Jogger double stroller here. 4. Contours Options Elite Tandem Stroller. To be honest, we are partial to the side-by-side double strollers for one silly reason: once the kids get a little older they will inevitably start fighting about who gets to sit in the front. If your kids are anything like mine, that fight never ends well! But here is an awesome and incredibly versatile tandem option. Tandem means that one sits in front of the other, rather than side-by-side. In our tests, the Options Elite is the best tandem stroller on the market. Tandem has a few advantages to the side-by-side: first, with this stroller you can configure how your kids are sitting. Want the infant facing you, but the toddler facing forward? Want both facing forward? That's fine too. When you have an infant and toddler, the tandem feels really great. You can put the infant in back up higher facing you, making feeding and helping your baby super easy. And the toddler can face forward to see all the action. The side-by-side isn't great with an infant car seat, as it's hard to reach over and forward to where the infant car seat attaches. So the tandem wins in that regard. Second, at only about 26" wide, this tandem is great for fitting into relatively narrow places. As a silly example there is a narrow side entrance to our local children's museum that only the tandem could fit through. But the tandem has some down-sides. It doesn't fold as flat as a side-by-side. In fact, the Options Elite folds to 21" x 26" x 39" which is even larger than the BOB in terms of overall space taken up in the trunk. Even though it is quite large when folded, it is also very well equipped. It has a cup holder for parents, a huge storage compartment with side zipper access (! ), stands on its own when folded, and has really nice seating surfaces with padded headrests and adjustable footrests to accommodate growing babies. The Options Elite also includes one infant car seat adapter that works with most of the major infant car seat brands (Graco, Chicco, Britax, etc.). If you need to attach two infant car seats, you'll need to buy an extra Contours brand car seat adapter at a very reasonable $20. Note that the Baby Jogger City Select Double tandem stroller is another great (but expensive at $800+) option, but the seating is more crowded than the Contours and we think the price is a little excessive (but if you want a luxury double stroller, that's a fantastic option). Interested? 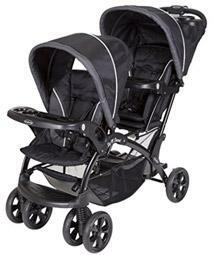 You can check out this Contours double stroller here. 5. 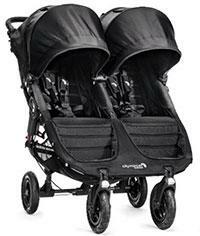 Baby Monsters Easy Twin 3.0 Double Stroller Review. We received this stroller in late 2018 for testing and we were really impressed with several of its features and capabilities. Out of the box, it was super easy to assemble: just attach the wheels and the accessory kit (including seat pads, shoulder pads, and the canopies) and you're off to the races. Note that the accessory kit comes with it, and is what gives it color. The entire stroller is black with the exception of the accessory parts. This actually gives some cool versatility because you can do funky things like swap out the colors by buying a different color accessory kit, or even have one blue and one pink canopy! You can also attach the included bumper bar up front if you're interested. Folding and unfolding was effortless, though you do need to use two hands for the folding process (since there are release buttons on the right and left sides). Once it was assembled, we thought it was super smooth and maneuverable, and it was easy to get through doorways (it's about 26" wide), up and over curbs, and up small flights of stairs. The entire thing felt really well built and sturdy, making the price a little more understandable (about $780 right now!). There are tons of adjustments for parents and kiddos. The handlebars adjust/swivel up and down for parents who are shorter or taller. The seats recline continuously up and down (not between discrete settings), though the recline adjustment does require two hands to adjust upward. The front wheels can swivel or be locked-out, and the 5-point harness is adjustable height and tightness. The canopies are enormous and cover basically your entire children and they provide UV 50 protection. If that's not enough, it also comes with a full plastic rain cover that fits really nicely and protects the entire thing. Additional features include suspension to absorb the bumps, and rear foot-brake that is super easy to use, and each seat is a reasonable 14" wide. We also loved the air circulation system - there are little zip-open mesh windows on the back and sides of each seat that provide some great ventilation when it gets hot outside. Nice touch! The storage basket on the bottom is reasonably sized, and is accessible from the side even when the seats are reclined all the way back. Speaking of recline, the seats recline nearly all the way flat and there are little adjustable foot rest that can be put all the way vertical for napping babies (making it a bit more like a bassinet basket). When the seats are all the way up, they are still more reclined than we'd prefer, especially for older toddlers and kids. Did we mention how big this thing is? We measured it at about 34 pounds with the accessories attached. When folded up, it measures about 26" wide by 34" long and 17" high. If you need to save a couple inches in height, you can easily pop the big rear wheels off. Cons? A couple things worth pointing out. First, there was a bit of slack in the handlebars so when you push forward or pull back, it wiggles a bit in place, which made it feel a little flimsy. Second, when the seats are positioned in the upright position there is very little room for the shoulders and head because of all the fabric that bunches up around the perimeter of the seat. Third, the bumper bar is a one-piece bar that attaches to the entire stroller instead of each seat separately, and when you detach it from one side to swing it open, the other side pops off. Fourth, a couple times when we folded it up, one or more canopy attachments popped off; they're easy enough to put back on, but it was sort of a pain. Fifth, no cup holders for parents or kids, and we didn't notice any storage pockets at all for keys or anything else. Finally, the cost is prohibitive for most parents, coming in at nearly $800. So some definite inconveniences and drawbacks here, for what is otherwise a fantastic double stroller that's worthly of this spot in our top 5! Interested? You can check out this Baby Monsters Easy Twin Stroller here. 6. 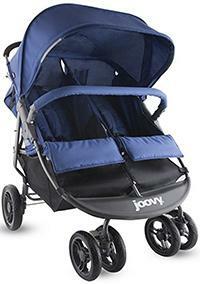 Joovy Twin Groove Stroller. 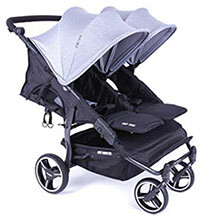 This is an excellent double umbrella stroller for twins, with some great features and reliability. Joovy is known for making excellent baby products, and this Joovy Twin is no exception, though it's definitely behind the more robust Joovy Scooter X2 double stroller. If you're limited on storage space in your home, or have a smaller vehicle, this double umbrella stroller might be a good option for you - it folds down into a very compact package measuring about 42" long, 22" wide, and 16" high. That smaller folded size will fit pretty easily into most trunks, even for relatively compact cars. And getting it folded down was a breeze, using a onehand fold that quickly collapses into the relatively compact package. Unfolding is a bit more of a chore as it's a little heavy (25 pounds, in spite of their "ultralight" label) and more cumbersome than the others in this regard. But once it's unfolded and ready to go, it's definitely one of the better strollers for infant and toddler use. Let's start with some of the great features. This double stroller uses a side-by-side configuration, and can support up to 100 pounds total (for example, 50 pounds in each side). For newborn babies there is a nice bassinet mode that allows you to recline the seat nearly flat (about 85% or so flat) and pull up the footrest vertically and cover the feet with an included mesh foot-muff. So that means that baby's feet will be able to push up against the bottom of the seat, and be covered by a mesh to help them feel a bit cozier. The mesh cover goes up over the lower legs and knees, nearly to the baby's waist. There is no extra infant insert or anything to keep your newborn positioned, but in our testing we didn't really find that to be an issue since the recline is pretty far back. The bassinet feature is instead of the ability to snap in a car seat - there is no connector or adapter to attach a car seat to the stroller, so this is definitely not an ideal stroller for that type of use (but there is the Joovy Twin Roo+ Car Seat Stroller for that type of use). When your baby gets a bit older, the overall functionality of this stroller was pretty good. There are plenty of recline options to suit a growing baby; while the seat was easy to recline, it was relatively tough to push back up unless your baby isn't in the seat. There is a great bottom storage bin, mesh pockets inside the seats (on the sides) for babies and toddlers to use with a bottle, sippy cup, etc, and there is a cupholder for mom or dad. The big storage bin was nice, though it's very hard (or impossible) to access when a seat is reclined. The 5-point safety harness was easy to use and highly adjustable. We found that all of the parts felt high quality and generally soft and comfortable. The seats were a bit tight, but that's to be expected in a double stroller that can fit through a 30" doorway without any issues. Our 37-pound 3 year old tester looked really large in it, but the stroller didn't seem to mind the weight and still maneuvered pretty well. Speaking of maneuvering, we thought the stroller was overall very easy to steer and control, though the 6 wheels made it likely that you were going to feel every little bump in the sidewalk. The canopies were reasonably large and provide UV protection - they are nowhere near the size and coverage of the Joovy Scooter X2 or the Baby Jogger, but pretty decent. So overall there are some great features with this double stroller, not to mention its reasonable price point around $150. But it also has some limitations that are worth considering, including the difficult to adjust recline, the relatively narrow seats, the lack of good cup holders for kids, the inability to attach a car seat, and a few other little things. Interested? You can check out this Joovy Twin double stroller here. 7. Baby Trend Sit and Stand Double Stroller. 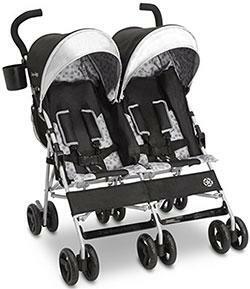 As we noted above, we are quite partial to the side-by-side double strollers, but here is another great tandem double stroller that is most similar to the Contours, but a little less versatile and a lot less expensive. This double stroller can be used with two toddlers, or two infant car seats, or one infant car seat and one toddler. Infant car seats would always be rear-facing, and toddlers always front-facing. It also has the "stand" functionality, which means that the back seat can be removed to reveal a platform that older kids can stand on (or sit on as a "jump seat"). The toddler seats support up to 40 pounds each, and the standing/jump-seat platform up to 40 pounds as well. To be honest, we went far over that 40 pound limit for the jump seat, and it seemed completely fine. We really liked the smooth and easy to steer handling of this stroller, which was helped by the soft rubber wheels and smooth bearings. We also thought the canopies were quite good, though they did not provide as much coverage as the Contours. Each seat as swing-out trays with cupholders, and there's a covered tray with 2 cupholders for parents as well. Those are very convenient to have. Assembly wasn't terrible; there is the large stroller frame, and then you need to attach the canopies, trays, and wheels. Everything snaps together, no tools required. the front seat has a 2-position recline that doesn't go too far back, to avoid completely occupying the rear person's space. The rear seat has a much more extended recline, so this is where you'd place the sleepy toddler who needs a nap. The seats themselves are completely fine in terms of comfort - not too firm or soft, and the fabric is easy to wipe clean as needed. We tested several infant car seats to see which would fit into this baby stroller, and we found that no modern Britax seats fit, however we did have luck with the Baby Trend Flex Loc series, the Evenflo Embrace, and the older Graco SnugRide and SnugRide 32 models (NOT the Click Connect models). So if you want to be able to click the infant car seat into the trays, you will basically need to use the Baby Trend Flex Loc series. This seat is on our best infant car seat list, but is rated pretty low relative to other options. The Contours is compatible with a much wider range of infant car seats. Some additional cons? Well, the storage basket was small and really difficult to access if you have 2 kids in the stroller. It's heavy and a bit cumbersome to fold and unfold, though we were able to get it easily into the trunk of a Camry, Accord, and Impreza. So overall, some limited versatility here, but a great overall double stroller option for an excellent price. Note that Baby Trend also makes the Baby Trend Expedition Double Jogging Stroller, which is a great inexpensive (about $175) double jogging stroller. Interested? 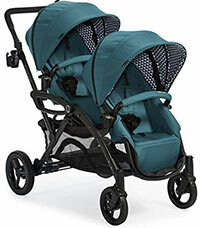 You can check out this Baby Trend double stroller here. 8. Graco DuoGlider Click Connect Stroller. For parents using Graco Snugride Click Connect car seats, this is definitely the best double inline stroller for compatibility with those car seats. This tandem stroller can hold two Graco SnugRide Click Connect car seats simultaneously in a rear-facing position, or you can place one car seat rear-facing and have a toddler or larger child (up to 40 pounds) sitting in the regular stroller seat. So that's some pretty good versatility and compatibility with one of the best-selling car seats available on the market, and at a price point around $130 that makes it look relatively inexpensive in comparison to the other double strollers on this list. In addition to its compatibility with Click Connect car seats and utility as a twin stroller, there are tons of other features worth mentioning. The rear seat folds completely flat, which is rare but awesome to have as an option for naps or to use as a baby bassinet. A cool thing to mention about this reclining seat is that you can still reach into the HUGE storage basket when it's reclined, using the baskets thoughtful adjustable side. Note that the front seat reclines as well, but nowhere near as far, otherwise they'd be laying in the rear passenger's lap! Each seat has a bumper bar (this is how the car seats attach) with detachable cup holders and a snack tray, and a 5-point safety harness as well. Note that when you're trying to attach a car seat to the Graco Duoglider stroller, you first have to detach the cup holders and snack tray from the bumper bar The stroller is also easy to maneuver around tight spaces, has a smooth ride with front suspension, and there is a covered tray for parents with a cupholder. The canopies aren't very big, but when you're using it with an infant car seat attached, you can completely cover the baby by using the car seat's canopy and the stroller's canopy together. Folding the stroller took two hands and can be a little difficult to lock, and there is some preparation involved, like getting the seat reclines into the upright position, and aligning the wheels appropriately. Once it is folded, it's still pretty large and will probably not fit into smaller trunks, at about 30" long and 21" wide, and about 12" thick. Unfolding is pretty easy but also takes two hands. The overall stroller is maneuverable but it's also really large and heavy, coming in at 30 pounds and seemingly as long as a limousine - at least that's how it feels when you're pushing it! Some other downfalls: the cup holders are really shallow so cups tend to tip over easily, and attaching and detaching the car seats takes some practice. So if you have a one or more SnugRide Click Connect car seat, and you want to attach one or both to a reasonably priced and well-featured double stroller, this is definitely a great option for you. Interested? You can check out this Graco DuoGlider Stroller here. 9. J is for Jeep - Scout Double Stroller. This is an excellent bang-for-the-buck lightweight double stroller, with an inexpensive price tag, good reliability, and several great features. This side-by-side stroller supports up to 70 pounds total weight, with 35 pounds of maximum weight in each seat. It uses a lightweight (only about 18 pounds) aluminum frame that folds into a rectangle that's about 13" by 42", and 11" thick, which is larger than most other options on this list. That's because it folds up like an umbrella stroller, long and thin. We fit it easily into Honda Civic and Toyota Corolla trunks. The downside of it folding like an umbrella stroller is that the handlebars aren't connected to one another in one long bar, unlike the others on this list. That made it a bit less comfortable to maneuver, especially when doing it one-handed. In our testing, we thought the large canopies did a pretty good job protecting from the sun and light rain, especially for this low price range. They are nowhere near as large as the Joovy or Baby Jogger canopies, but they do a nice job. We also thought the seat recline option was nice to have, though the recline range was restricted and the mechanism was finicky to use. For safety, there is a 5-point harness and locking back wheels. We also loved that there are several storage pockets (4 of them! ), and it came with a cup holder for grown-ups; note that the cup holder is detachable for squeezing through tighter spaces (like smaller doorways). We thought the overall ride quality was relatively poor, given the relatively small and hard plastic wheels. Overall, we thought the build quality was about a 6.5 out of 10, which is to be expected in this price range for a double stroller. Cons? Well, its light weight makes it feel a bit less sturdy, though we think it is worth the easy folding and lifting into the trunk. The canopies could come down a bit farther, and the recline feature was a pain to use. Other than that, if you're looking for a lightweight, inexpensive double stroller, this is definitely an excellent option! Interested? You can check out this Jeep double stroller here. 10. Thule Urban Glide 2 Stroller. This is a beautiful and sleek double stroller with an awesome looking aluminum frame, large diameter wheels, and an understated design. This is the real urban stroller for those who want a side-by-side stroller that looks and functions great, and are willing to pay the price. Not only is it beautiful and comfortable, it has some great features. A hand-operated parking brake, adjustable ergonomic handlebar, smooth riding rear suspension, big canopy with peek-through window, and reclining seats. Some fun extras include a storage area that can be fully closed to protect from the elements (and from sticky fingers), real air-filled rubber tires, and a truly awesome smooth folding design. Folded up, the Thule is one of the smallest on our list, folding down into a 35" by 31" rectangle with about 14" of thickness. That's less trunk volume than the BOB or Contours, but not quite as compact as the Baby Jogger. Opened up, the Thule is about the same width as the BOB, just under 31", so you won't have any issue with exterior doors on houses or businesses. Unlike the Baby Jogger and Contours, the Thule is actually built for jogging. The large diameter wheels, hand-operated brake, and rear suspension make this super smooth and low rolling resistance for long runs on pavement or trails. The weight is on par with the others, at 32 pounds. Cons? Well, it does stand nicely on end when folded, but it can't be rolled when folded (the old Thule 1 was able to do that). And unlike the Contours, it doesn't include an infant car seat adapter. Finally, it's too expensive for our taste. Otherwise, it's one of our all-time favorite side-by-side strollers if you can stomach the price! Interested? 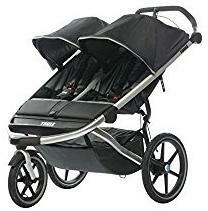 You can check out this Thule double stroller here. 11. 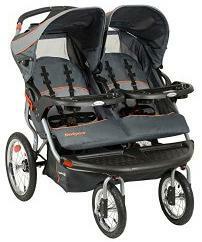 Baby Trend Navigator Double Jogger. Here is an awesome option for the (relatively) budget-conscious double stroller buyer. Coming in lowest on our list of best double strollers, this stroller offers a lot of bang for the buck. It's no BOB or Baby Jogger in terms of style or overall build quality, but it offers a wallet-friendly alternative to the otherwise dauntingly expensive double stroller market. The Baby Trend wins overall for the number of included features. It has an awesome parent tray with two cup holders, storage, and built in speakers for your MP3 player! It has real air-filled rubber tires, locking front swivel wheels for running, a medium sized canopy with peek-through window, reclining seats, parking brake (not a hand-operated brake, just for parking), large storage basket, and a reasonably easy folding sequence. It's also the only one on our list that includes the two kids trays! It also fits two infant car seats, the Baby Trend ones (with the Flex Loc attachment) will snap right in. But with these features comes some limitations that are expected given the price. The rubber tires are nice, but there is no suspension to help over sidewalk cracks or trail bumps. The canopy doesn't come out as far as the other options, and the parking brake can't be used to help slow down on a hill (it's only for parking). Also, the divider between the two kids is relatively small so the kids can easily see and reach each other, for better or worse! In our test, we also found the reclining feature a bit awkward to adjust when a kid was in it, and thought it was a little wobbly/unstable when running. This stroller is a little excessive in its width (just under 33" wide), about 2" wider than most, which might make it a pain to line it up perfectly for fitting through a door (with under an inch clearance on each side). It's also the heaviest on our list at 43 pounds! Overall though, if you can look past some of the little drawbacks this is a real winner for the price point! Interested? 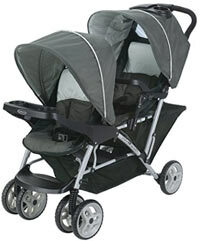 You can check out this Baby Trend double stroller here. Here are some more details about the factors we considered when finding the best double strollers of 2019! Flexible Infant and Toddler Configurations. The best double strollers can be reconfigured to satisfy even the pickiest parents. Take the Contours Options Elite Tandem Stroller as an example (#4 on our list), which can be reconfigured in seven different ways. You can have an infant car seat and a toddler seat, one facing you and once facing forward. Or you can have two infant car seats facing you, two toddler seats facing forward. And the list goes on! When selecting a double stroller be sure to think a bit about how you'd like it to be configured, and make sure there's some flexibility because, as it turns out, kids start to get a little demanding as they get older! Comfort. Many double strollers, whether tandem or side-by-side, compromise comfortable seats to keep the weight and size down. But there is a happy medium between an enormous and heavy baby stroller with super comfortable seats, and a sleek lightweight stroller with seats that feel like sitting on a piece of wood. Because manufacturers try to keep weight and cost down, some double strollers have very uncomfortable seats. We've done the hands-on testing and found the best double stroller seats that are the most reasonable compromise of comfort and weight/bulkiness. Size and Weight. Double strollers can be huge and inconvenient. About 5 years ago a good friend of mine had a side-by-side double stroller that she couldn't fit through the front door of the local coffee shop! So there she was trying to get herself an iced coffee to reward herself after a morning full of fusses and tantrums, only to find that she couldn't even get in the door. She just about threw the stroller in the dumpster at that moment. Don't end up like Amy. Our review and list considers width and length, because the best double baby strollers strike the right balance between big enough to be comfortable versus too big to fit in doorways. We also consider weight. Double strollers can get very heavy, especially if you're attaching infant car seats. You can tip the scales over 50 pounds with two infant car seats. Think you could get that down a set of stairs, or into the trunk of your car? Only if you've been spending some time at your local CrossFit! Folded Size. Manufacturers have gotten really clever with folding double strollers, making them not quite as cumbersome as they used to be. The best double strollers will fold to about 1.5 times the size of a single stroller. But that's still quite large. We tested the Options Elite in the back of a CR-V and it just about took up all the trunk space. While they will all be quite large, some are better than others. If you plan on fitting it into a regular trunk, you might want to grab that measuring tape and check on some sizes before ordering. We provide folded sizes in our reviews. Compatibility with Infant Car Seats. If you plan on including at least one infant car seat on the stroller, you need to be sure that it is compatible with your particular brand and model of infant car seat. The best double strollers reconfigure between infant and toddler use "universal" car seat adapters to accommodate most of the major brands. Be sure to check the details.